VLT 5000 Flux is an extension of the VLT 5000 series. Full torque control also during acceleration as well as very accurate speed control even at low speed or standstill can now be obtained. Flux control is the future technology for high performance drives. It provides excellent dynamics and accuracy, suited for drive systems with and without feedback. 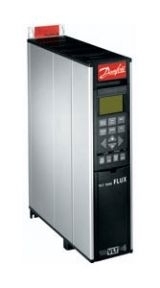 The VLT 5000 Flux features automatic acquisition of motor-equivalent circuit diagram and provides 100% control of flux and torque, taking the system inertia into account. The VLT 5000 Flux provides up to 160% torque from 0 to rated speed.